Every photographic process gives the object its specific form and materiality in which it exists in the first place and at the same time leaving traces behind. In the digitisation of historical film material these specific characteristics of the image and, if available, of the sound information are recorded. At the same time, however, characteristics of aging and traces of wear and tear are also mapped, which, for example, become noticeable through mechanical damage such as scratches, dirt and, last but not least, through changes in colour and density of the film material. The viewing of films for digitization is a time-consuming process. In addition to assessing the picture and sound quality the material must be tested for its mechanical strength and, if necessary, measures must be taken. A distinction has to be made between the mechanical treatment of the film such as repairing defective adhesive spots and damaged perforation etc. in order to make the digitisation of the material possible and the restorative post-processing of the film in the first place. Film archives and film archivists are the guardians of the World Heritage of moving images. It is their responsibility to protect this heritage and to pass it on to posterity in the best possible condition and as a true representation of the work of its creators. The „Code of Ethics“ is a binding standard for film archives, but also of great assistance when it comes to preserving the integrity of the material, i. e. protecting it from any form of manipulation or censorship of the material. In the Delft digitisation project of the Ethnological Film Collection, archival copies are also examined for their preservation status and image quality in order to determine the digitisation of the material (the TIB is in possession of the archival copies as well as the release copies and, if one of the archival copies turns out to be defective, the release copies available in duplicate for each film can be used). 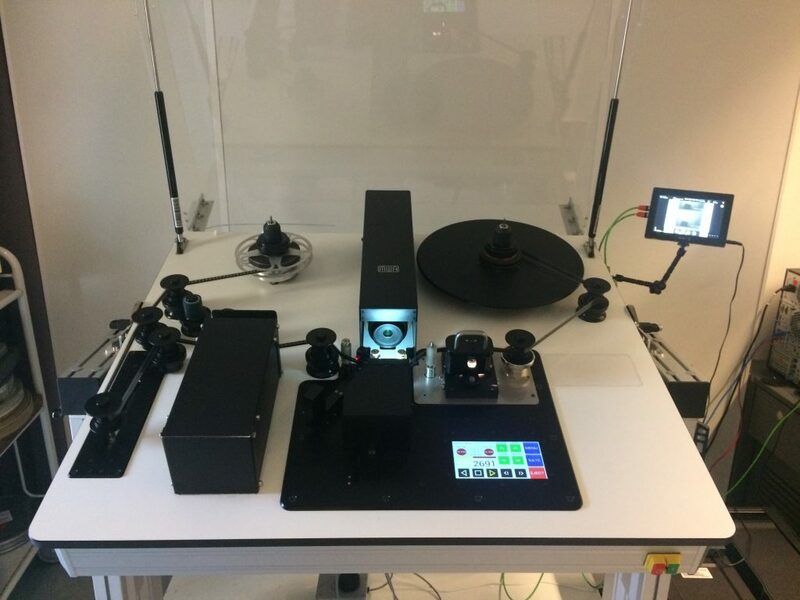 Three devices are currently being used in the project: a film tester for diagnosing mechanical damage, a film projector with connected monitor for checking the image quality and a separate device for viewing the tapes. In addition to the viewing of the films, the technical metadata and data on the state of preservation of the films are simultaneously collected. Would it not be an obvious advantage to shorten this time-consuming process by integrating all processing steps in one device, which is capable of capturing all metadata in such a way that it can be processed without any problems? Such a device does in fact exist and was developed during a joint research project between the German Broadcasting Archive, the WDR mediagroup digital and the Hasso Plattner Institute, funded by the Federal Ministry of Education and Research (BMBF) (2014-2017). At present, this so-called diagnostic scanner is located in the Deutsches Rundfunkarchiv in Potsdam-Babelsberg, which was then also the goal of our expedition to determine the state of health of the ethnological film collection. The diagnostic scanner developed in the dwerft joint project integrates the above-mentioned work steps into one device. The system is equipped with a special scanning technology with appropriate sensors for gentle, semi-automatic detection of archive material. The data on the condition of the film material obtained during the scanning process are not only recorded and analysed by means of special software, but also interpreted and subsequently recommendations for subsequent digitization can be derived. In addition, digital copies of the image and sound content are generated, which allow a file-based viewing and thus the content-qualitative evaluation of the resulting film material. Fig. 1 Diagnostic-scanner at the German Broadcasting Archive in Potsdam Babelsberg. Photo: Miriam Reiche. The scanner is designed to transport the films continuously and without the use of toothed rollers. The drive of the diagnostic scanner enables a largely straight-line film guidance by means of a few deflection rollers with large diameters and large wrap-around angles. This means that historical film material can be scanned regardless of the state of preservation without extensive manual preparation, such as the renewal and renovation of bonding points. Even strongly shrunk films and brittle film material can be scanned without any problems. An integrated surface analysis system was developed for comprehensive condition assessment. This enables the automatic detection, analysis and statistical evaluation of various defect categories such as splices, scratches, dirt and perforation damage. Fig. 2 Damage mapping of a frame (single image) of the IMF film Signature C 183: The arbitrary movable artificial hand (1937) by Prof. Dr. Sauerbruch. Screenshot: German Broadcasting Archive. The sample copy A is in a very good condition; only at the edge of the film dirt and scratches were found, caused by the mechanical load of the film transport. Condition mapping serves as a documentation and planning aid for repair measures; they are an essential part of an effective plan of conservation measures in restoration. 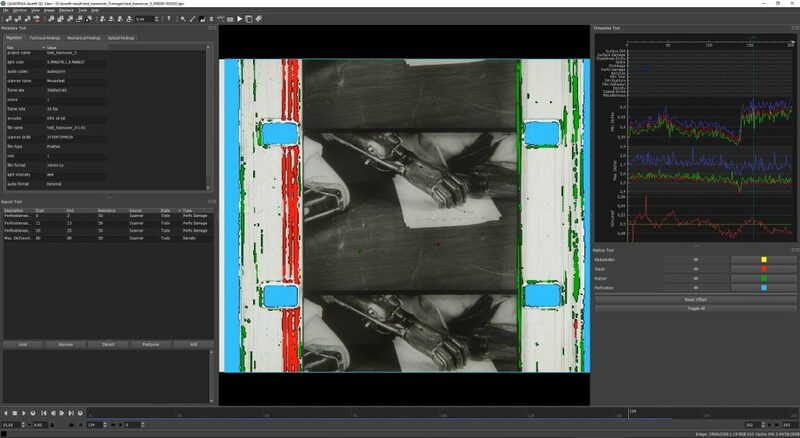 In the assessment process of the film material, damage mapping of each individual frame (single image) is carried out, see figure 2, enabling the exact calculation of the required extent of the repair measures and the planning of the digitisation. Defective adhesive spots are detected by two parameters, for example: the adhesive edges as bright lines in the image and minimal changes in perforation. However, an optimization need of the diagnostic system is still indicated, for example, a scratch can be evaluated as contamination, because scratches create depressions, which are associated with a material displacement, i. e. each depression simultaneously generates an increase which can be perceived by the scanner as contamination. The interpretation of the results by the scanner must therefore be checked critically. The diagnostic software detects and interprets the damage and makes recommendations for subsequent digitisation or repair of the film (repair of splices, cracks, perforation damage, cleaning, etc.) in a detailed report. It also attempts to estimate the amount of work involved in repairing the original film material (in hours per minute). 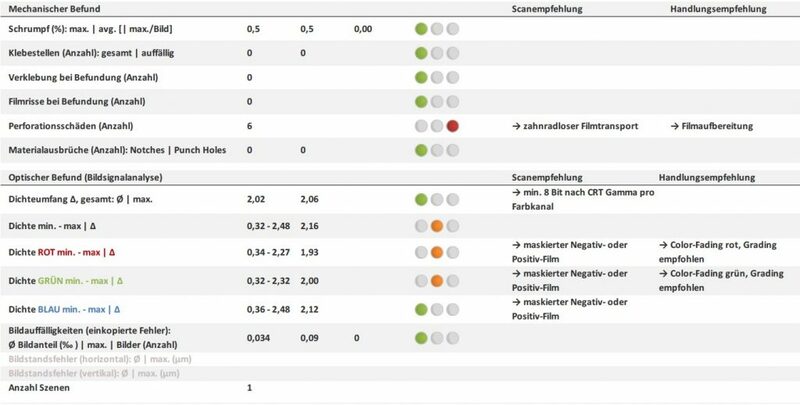 In addition to the technical metadata, the diagnostic report contains data on the overall condition of the film: the mechanical-optical findings, audio findings, data on the minimum and maximum density as well as the degree of shrinkage of the film. Fig. 3: Excerpt of the findings report with scan and action recommendations for example copy B of the IMF film Signature C 183: The Arbitrary Movable Artificial Hand (1937) by Prof. Dr. Sauerbruch. Due to the speed and high reliability of the optical detection, the recommendations are symbolically transmitted in a traffic light system. The red dot indicates that the software has detected perforation damage and recommends a gearless film transport during digitization or repair of the film perforation. The metadata generated during the diagnostic process is transferred to the diagnostic system as an XML stream via an interface developed in the dwerft project. Both metadata of the archive and the findings can be generated in LPDC format (Linked Production Data Cloud). This enables a number of application scenarios. Archive data as linked data increases the findability, interoperability and reusability of archive data and thus the AV content. In addition, a digital copy of the image and, if present, sound material is available from the film scanning carried out for the diagnosis. This may not be of sufficient quality due to the dirt that is still visible in the image area, the low contrast range and insufficient color correction. In any case, however, it offers the possibility of content indexing and evaluation as well as digital security of the current state in specified quality, provided that the analogue film material is carefully stored in this usage scenario. In the future, it will be the task of the TIB to ensure that the valuable IWF-Film collection is preserved in such a way as to guarantee the conditions for the long-term digitization of the materials. Cultural customs and handicraft traditions, some of which have already disappeared or have changed considerably over the years: This is documented by the 1,953 ethnological films that the TIB will digitize, index and – as far as legally possible – make available online in the AV-Portal. The films are part of the IWF Wissen und Medien stock (formerly Institut für den Wissenschaftlichen Film), which was transferred to the TIB in 2012. The ethnological films show cultural customs such as music and dance, religion and medicine and much more. Some of the films are more than 100 years old, the most recent date back to the 1980s. The majority of the films are part of the „Encyclopaedia Cinematographica“. The DELFT project is funded by the Federal Ministry of Education and Research (BMBF) over a period of two years. Restauratorin M.A. und Mitarbeiterin im Projekt Delft Digitalisierung des Ethnologischen Filmbestands. Weiter → Nächster Beitrag: Forschungsdaten – Schritt für Schritt. Wohin aber geht die Reise?